The 10 Best Garden Centers and Nurseries in North Dakota! When the weather gets warm in the Midwest, it can be a truly beautiful place. For those of you that hope to turn your backyard into your own private paradise, leaning on the experts can be the leg up that you need. In North Dakota, the following garden centers can help you get your green thumb on. You don’t have to travel to the big city to get the flowers or specialty products you are looking for. B & B offers a wide variety of flowers and plants, a full-service espresso bar, and a gift shop full of unique, must-have items. Shotwell has been a staple in the Red River Valley for years. With a plethora of flowers, plants, and trees as well as a variety of home décor, Shotwell is a one-stop shop for all things garden and flower related. Same day delivery service Fargo can ensure that you have what you need to get the job done right. Sheyenne Gardens proclaims themselves to offering “the area's largest variety of trees, shrubs, bedding plants and plant materials.” Located just 10 minutes from the greater FM area, Sheyenne is a great place to find larger items or those not typically found in a conventional greenhouse. All Seasons has been the place to shop in Grand Forks for all things gardening since 1980. With a full showroom, nursery, and gift shop, they are sure to have exactly what you are looking for. In addition, they are known for their professional and knowledgeable staff who are always on hand to share their expertise. Four generations of Cashmans have turned their tiny nursery into a mega player in the garden industry. They specialize in gardening and landscaping materials and hold special seminars throughout the year. Check out their website for a complete list of available classes and training sessions. Established in 1952, Handy Andy’s has been enhancing green thumbs all over Williston for decades. 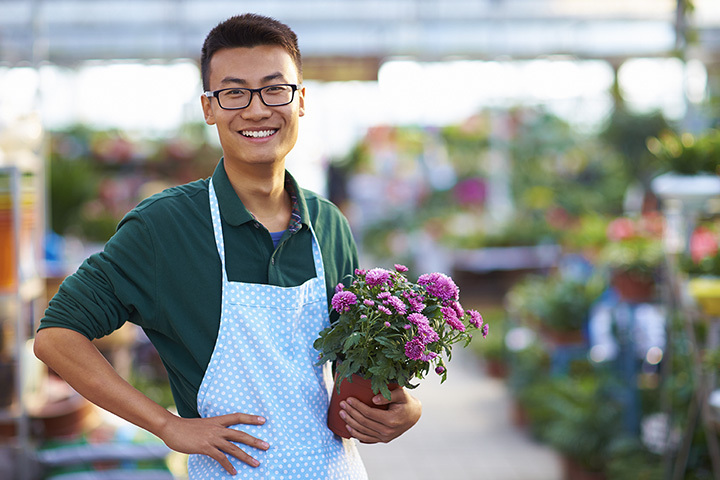 Privately owned and operated, you can expect big-town quality with a small-town feel when you shop for your flowers, trees, or shrubs. Another multi-generational business, Green Thumb has been quietly expanding since opening in 1965. With the addition of a fully-automated 14,000-square-foot greenhouse in 2004, the business now occupies over 50,000 square-feet of gardening greatness. All plants are grown on-site, so you know exactly what you are paying for. Whether you are looking to buy flowers or plants for your garden or would like to purchase professional gardening/landscaping services for your home or business, S & B has what you are looking for. With over 30 years of experience in the gardening/landscaping business, Shea’s has the experience and reputation to help you create the perfect gardening space. Open year-round, Shea’s professional staff can help you do everything from picking out the ideal flowers for your bed to helping you design an entirely new landscaped yard. While located in Moorhead, Holland’s has been serving the Fargo, North Dakota-area for over 40 years. In addition to carrying everything you need for your garden, Holland’s also has a wide variety of furniture, home décor, art, and specialty products. They also have both an indoor and outdoor play area, so a trip to Holland’s can be a fun and rewarding trip for the whole family.